Daughter of Sir Charles Gavan Duffy, she was born in France and came to live in Ireland in 1907. 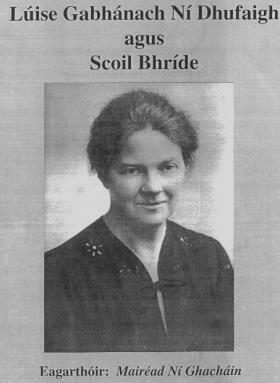 Between 1911 and 1912 she managed and taught at Scoil Ide, a school for girls set up by Padraig Pearse. In 1914 she joined Cumann na mBan. She found out about the Rising on Easter Monday 24th April 1916 and made her way to the GPO where she told Padraig Pearse that she did not agree with his course of action. She stayed on, however, to help in the kitchens on the top floor and when the GPO was evacuated the following Friday she went to Jacob’s factory where she also argued with Thomas MacDonagh about the needless resort to armed force. After 1916 she went on to become an influential member of Cumann na mBan’s executive and a signatory of a petition demanding self determination for Ireland that was handed to President Woodrow Wilson by Hanna Sheehy-Skeffington in 1918.